Hihi, I am Tyler and nice to meet you all. This is my 'FRIST TIME' posting to this blog, kinda nervous, hehe..
For those who like japanese drama, sure you will remember the 'Crystal Apple'. During 2004, the japanese drama 'Love Generation' made the crystal apple become famous and until now still u can see this crystal apple in many shops. 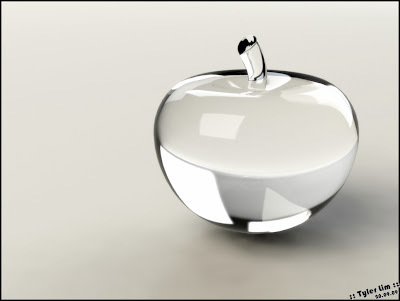 Just yesterday, i was chatting with my friend and suddenly this idea flashed up in my mind, therefore i decided to create this crystal apple by Solidworks. Also, i wonder about whether PhotoView360 is able to render for glassy or crystalline effect or not. Use the spline line to sketch out the cross sectional area of apple. After that, use the revolve features to make it into 3D..
For this Stalk, u may use either Swept or Loft feature to make it. Here, i tried for Loft feature.. jz as the picture, i used two profile and two guide lines to make this stalk. Ermm~ so, this is my 1st post.. welcome to comment..
Good sharing! Tyler! Kambate~ i think the crytal apple can hunt many gals' heart! muahaha!